Our students scored a 100% pass rate in the 2012–13 Praxis II Social Studies: Content Knowledge. Social studies—encompassing history, culture, economics, political science, civics and more—enables you to develop a deeper understanding of our world and your place in it. 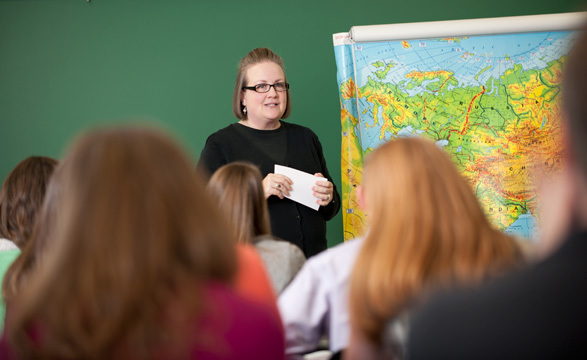 BJU’s composite social studies education program is specifically designed to prepare you to be an innovative, effective and Christ-centered educator in the social studies field. Our program is approved by the South Carolina Department of Education and leads to initial South Carolina state licensure (licensed to teach grades 9–12 in a public school setting). Graduates from BJU’s composite social studies education program have also been accepted into leading graduate schools and are working in diverse careers across the United States. Our program offers excellent preparation in all of the major content areas of social studies. You will begin with courses ranging from Introduction to World Cultures to United States History to Foundations of Economics that will give you a solid foundation in your content area. You’ll then be able to build on that foundation through a plethora of history and social studies electives. For example, if you’re particularly interested in American history, you may choose classes such as Religion in America and Civil War & Reconstruction. Or if you’re hoping to focus on political science, you may take classes such as Comparative Politics and International Relations. The methods classes you’ll take, such as Teaching Social Studies (9–12), will equip you with diverse instructional strategies for communicating content in fresh, engaging ways. You’ll also receive training in the most up-to-date educational technology such as Promethean boards and iPads, providing even more exciting tools to help your students learn. Most important, you’ll gain plenty of real-life experience in the classroom through practicum and clinical practice. You’ll also benefit from the BJU Core, a unique combination of Bible and liberal arts courses taken by every BJU student. Bible courses, as well as daily chapel services and godly professors, will nurture your growth in Christlikeness. Liberal arts courses will broaden your horizons and equip you with skills essential both for teaching and for all of life—skills such as critical thinking and problem-solving, effective communication, ethical decision making, adaptability and much more. Because the composite social studies education program is comprehensive, there are no general electives included. However, with plenty of social studies and history electives, you can choose to focus on areas of social studies that most interest you. If you wish, you may take extra classes outside of your program, and you may also take online courses during the summer to free up your class schedule during the semester. The composite social studies education degree is essentially a double major in history and political science. The breadth and depth of this major prepares aspiring teachers to be able to teach everything from geography to government. The program content is tough. The instructional methods are rigorous. Looking back on my training, I realize that the level of rigor I had was essential to weather times of challenge and to capitalize on teachable moments inside the classroom. Long after graduation, my professors have offered assistance with everything from mock congress curriculum to Election Day analysis. In recent years, I have been able to work as a cooperating teacher for BJU student teachers. Their training and professional demeanor set them apart from the rest of their peers. Social studies teacher, Mauldin High School, S.C.
Director of the Office of Charter Schools in the North Carolina Department of Public Instruction, N.C.
Attorney at Thorne Grodnik, LLP, Ind. Social studies teacher and department head, Travelers Rest High School, S.C.
Social studies teacher and director of speech/debate, Riverside High School, S.C.
Headmaster of Athens Christian School, Ga.
Middle and high school history teacher, Community Christian School, Ind. Both content knowledge and classroom experience are essential for confident teaching. Your teaching preparation moves gently from classroom observations to after-school tutoring to practicum two mornings a week. Meanwhile, your methods classes will give you plenty of practice in lesson planning. By the time you begin your clinical practice your senior year, you will be well prepared with numerous lesson plans and unit plans under your belt and at least 100 hours of classroom experience. Clinical practice is the capstone experience of your preparation. You’ll have the opportunity to spend a semester in a local public high school, working with a social studies teacher there, as well as with a BJU professor to give you feedback every week. This semester of clinical practice, along with completion of required classes, passing scores in the PRAXIS II exam and a favorable recommendation, leads to South Carolina state teacher licensure for grades 9–12. Professional development. You have the opportunity to hear speakers who are experts and practitioners in their particular field. From your education faculty to your history faculty, all your professors have years of experience in their field and nearly all hold terminal degrees. They’re involved in professional associations such as the Organization of American Historians, the Southern Historical Association, the American Society for Legal History, and the Association for Supervision and Curriculum Development. Create social studies instruction at the secondary level through the use of cutting-edge technology. Create social studies content-based learning that is global in scope and addresses various learning styles, ability levels and diversity among young adolescent learners. Plan, implement and differentiate social studies instruction that has a positive effect on the learning and development of adolescent students. Generate formal and informal assessment strategies to evaluate and ensure the continuous intellectual, social and physical development of adolescent learners. Develop a knowledge base in the ten broad social studies categories (culture and cultural diversity; time, continuity and change; people, places and environment; individual development and identity; global connections; individuals, groups and institutions; power, authority, governance; production, distribution, global connections, civic ideals and practices; science, technology and society; and consumption of goods and services).